This article describes how to configure port forwards on a UniFi Security Gateway, and how to troubleshoot them if not working as desired. 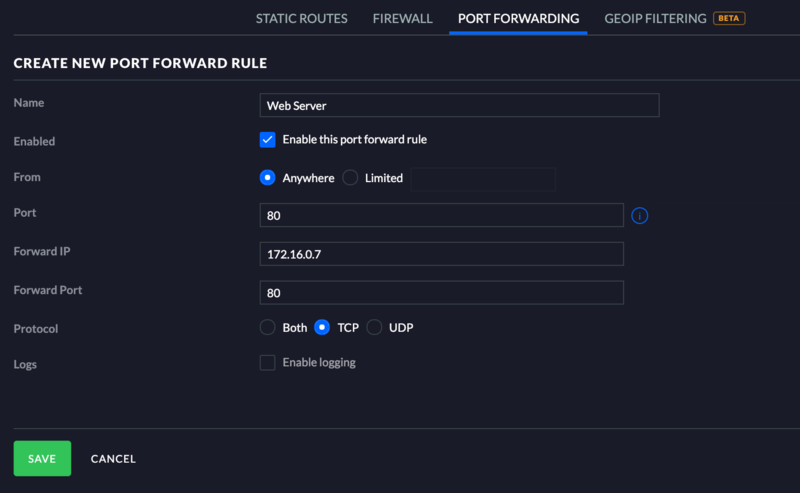 Port forwards allow you to redirect traffic destined to one or more ports on your USG's WAN IP to an internal host, most commonly to make servers accessible from the Internet. UniFi Security Gateway (USG) port forwards are configured in the Routing & Firewall section of the UniFi Controller in versions 5.6.29 and above. Before you begin, and to make these examples easier to follow, please note that the network depicted in the examples has a USG with WAN plugged into an Internet connection with IP of 192.0.2.117, and LAN with an IP of 172.16.0.1 plugged into a UniFi switch. On the LAN there is a Linux server at 172.16.0.7, which is running web and SSH servers. 1. 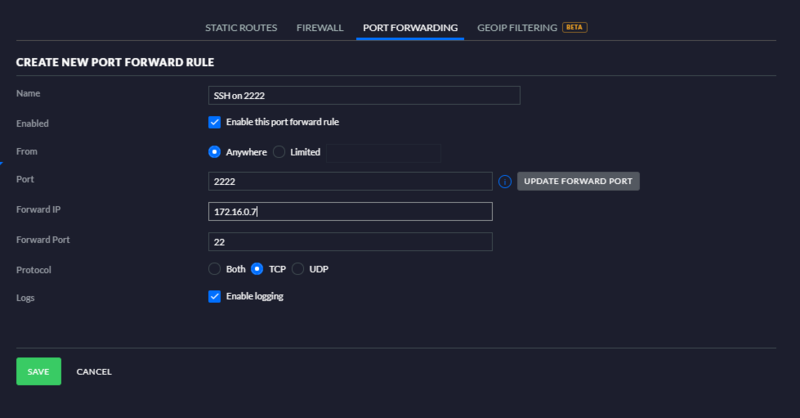 In the UniFi Controller navigate to Settings > Routing & Firewall > Port Forwarding tab > And click on Create New Port Forward Rule to configure your first port forward. 2. The following fields are available for configuration in port forwards. Fill them out according to your needs and click Save. The configuration will then provision to the USG, and the port forward will be active once provisioning has completed. Make sure to test your port forwards from outside your network on the Internet. Name: Descriptive name of the port forward for reference purposes only. No functional impact. From: This field specifies the source addresses that are allowed through the port forward. If you need the service to be reachable from anywhere on the Internet, you must select “Anywhere” here. In cases where you can limit the source IP or network that can use the port forward, it is best to do so, as it greatly limits the security exposure of your network. To restrict source IPs allowed through the port forward, select “Limited”, and in the text box to its right, enter an IP address (e.g. 198.51.100.123) or IP subnet with CIDR mask (e.g. 100.70.60.0/24). Only the specified IP or network will be allowed through the port forward. NOTE: If you need to permit multiple source IP addresses or subnets, you can add multiple port forwards, with a different “From” IP or subnet on each. Port: The Port field specifies the external port to be forwarded. This port on your WAN IP will be forwarded. Forward IP: This field specifies the internal IP address to use for the destination of this port forward. Forward Port: The Forward Port specifies the internal port to where the traffic is forwarded. Protocol: Here you can select TCP, UDP or Both (TCP and UDP) as the protocol forwarded. Most services use TCP. Unless both TCP and UDP are required, you should specify one or the other rather than Both. Logs: If Enable logging is checked, the USG will log the traffic that matches the port forward in syslog. 3. As an example, we'll create two port forwarding rules. Now that you are familiar with each field in the Port Forward tab, let's create some sample Port Forwards. For the first example, we're opening HTTP (TCP port 80) to the Linux server at 172.16.0.7. For this example, we'll forward external port 2222 to the Linux server’s SSH on port 22. SSH is a common example of a service that people often configure externally on a different port than internally, mostly to avoid the bulk of brute force attacks. There is no real security in doing so, as any system susceptible to an SSH brute force attack will be found and compromised regardless of port, but there is value in considerably reducing log spam from authentication failures, and not wasting system resources on processing the attempts. It’s preferable to limit source IPs or networks on such forwarded traffic, but if you have a requirement to leave SSH open to the Internet, using an alternate external port doesn’t hurt. Once again, click on Save. Once provisioning of the USG is complete, the Linux server’s SSH service will be reachable from the Internet on 192.0.2.117 port 2222. 4. Now the Port Forwarding tab will display the two configured entries we just created. You can click the pencil to the right of the entry to edit it, or the trashcan to delete it. In Settings > Routing & Firewall > Firewall tab the WAN IN firewall rules display the rules added to pass the traffic associated with your port forwards. These rules are not editable because they’re associated with the port forwards, and their configuration specifics all come from the port forwards. You edit or delete the port forwards to edit or delete those rules. If the goal is to SSH to the USG's IP address itself over the WAN, a rule must be created on WAN LOCAL. Settings > Routing & Firewall > Firewall tab > WAN LOCAL. This is not considered a port forward. To create a rule such as this follow the steps below. 2. Select the following:1. Click Create New Rule while on the WAN LOCAL page. 3. Leave all else at defaults, and press Save. 1. Create a firewall rule on WAN_IN to allow the port forward. 4. Leave all else at defaults, and press Save. set service nat rule 4000 description "WAN2 tcp 22"
5. The port forward should now work on WAN2 when tested externally. The NAT rule can be anywhere between 1-4999, with the lower number taking priority over the rules following it. You can also type the "?" key at any time in the command to bring up a list of available options you can type in. The changes made in SSH are not persistent across any provisions by the controller or reboots of the USG itself. A config.gateway.json file has to be created in order to make these changes permanent - see here. If you're testing the port forward internally, which is sourced from a client on a LAN or VLAN behind the same USG, hairpin NAT is needed. To add this, follow step 4 again, but change the "inbound-interface" to the interface of the LAN or VLAN you're sourcing the traffic from. If the source address and inside-address (target of the port forward) are on the same subnet, an additional SNAT (Source NAT) masquerade rule will need to be added to avoid asymmetric routing. If multiple ports are used in a single rule, "inside-address port" cannot/should not be used and/or needed as traffic will be forwarded to same ports as it is destined to on WAN interface. If it is desired to forward multiple ports to a host then separate rules should be created. There are a number of potential reasons for port forwards not working after they’re configured, most of which are outside of the USG itself, but the USG provides powerful tools to help pinpoint the cause of the problem. This section goes through the troubleshooting process when your port forwards aren’t working as expected. First, take a close look at your configured port forwards. A subtle typo in an IP or port number has tripped up all of us on occasion. The UniFi Controller won’t allow invalid characters, so no need to look closely for white spaces or anything along those lines. Just verify the IP and port is correctly entered. When testing your port forwards, make sure to do so from the Internet. A cell phone with WiFi disabled is a good option if nothing else is readily available. The next sections go through the process of troubleshooting from the WAN and LAN points of reference. The first step in troubleshooting port forwards is ensuring the traffic is reaching your WAN interface. If the traffic isn’t reaching the USG’s WAN, it can’t be forwarded. Packet capturing with tcpdump is the preferred method of troubleshooting, as seeing the traffic present or not present on the network definitively determines where the problem exists. The WAN interface on USG is eth0, and eth2 on USG Pro. The examples in this article refer to a USG, so we will use eth0. If you're using a USG Pro, substitute it for eth2. Without some filtering, the output of tcpdump will be difficult to decipher. A simple filter for destination port often suffices, though if it’s a port shared by other active traffic on the network, that alone is inadequate. The HTTP port forward for instance requires tighter filtering to eliminate unrelated noise. In our use case here, we will filter on destination host 192.0.2.117 (the USG WAN IP) and destination port 80 using the filter dst host 192.0.2.117 and dst port 80. The output that appears above shows a connection attempt to port 80 on USG’s 192.0.2.117 WAN IP, sourced from a remote host on the Internet with IP 198.51.100.114, using source port 51514 (source ports are random from the ephemeral port range). The “Flags [S]” part tells us it’s a SYN packet, the first packet of an attempted TCP handshake. Because we see this request on the WAN, we know it’s reaching the USG. If nothing were to show up in that capture while attempting to reach http://192.0.2.117, then we know something upstream of USG is preventing the traffic from reaching it. See the “Traffic not reaching WAN” section below for troubleshooting guidance. If you do see traffic coming into WAN, then next is to verify whether it’s leaving LAN. Now that you have verified the traffic is arriving on WAN, your next step would be to check LAN to see if the traffic is egressing the LAN interface. In this example we’re using a USG, where the LAN port is eth1. If using USG Pro, the LAN port is eth0, so substitute accordingly in tcpdump. If the traffic isn’t showing up on your USG WAN interface, something upstream of the USG is blocking it. Often this is a firewall or other packet filter of sorts built into your modem, or on some other upstream firewall or router. Refer to your modem’s manual to find out more about its configuration in that regard. The other common circumstance is your ISP blocking the port you’re trying to use. Business class Internet service generally does not have any ports blocked, however, it’s relatively common for residential service to have the ports of common servers (25, 80, 443, etc.) blocked. When you see traffic leaving LAN going to the appropriate destination host like shown in the final tcpdump output shown above, with three SYNs in a row sent to 172.16.0.7 port 80, the host isn’t replying to the traffic for some reason. Often this is a host firewall blocking the traffic on that system. The other common cause is the LAN host missing a default gateway, or having its default gateway configured pointing to a different system. In order to reply back via USG to make the port forwards work, the LAN host’s default gateway must point to USG’s internal IP.